As with skin anywhere on the body, itching of the cheeks is not uncommon. In fact the cheeks are more likely to itch for various reasons that tends to affect the face to a greater extent than other parts of the body. Itching of the cheeks is usually a minor problem but can sometimes be linked to serious skin conditions. For most people there is greater concern when any skin symptoms involve the face as it can be unsightly or may affect a person’s self esteem. Therefore itchy cheeks should be investigated by a doctor if the condition persists, gets worse over time or is accompanied by a rash. Why do the cheeks itch? Itch receptors are specialized receptors in the skin. These receptors may be stimulated by a host of different factors. Itching is a sensation that usually indicates a potential threat or minor injury to the body surface. It triggers a person to rub or scratch the affected area. The scratching action may be useful to remove any imminent threat or irritant on the skin surface. However, itching can be a prominent symptom in some skin diseases. Scratching in these skin diseases do not resolve the itching and may in fact worsen the condition as well as damage the skin. Itching of the cheeks occurs for many of the same reasons as itching anywhere else on the body. The cheeks are constantly exposed to the environment, skin care applications and along with facial hair, the skin is easily irritated. However, there are also several skin diseases that may also afflict the cheek area. Lesions ranging from pimples and plaques to vesicles (tiny blisters) and even cysts. Abnormal darkening (hyperpigmentation) or lightening (hypopigmentation) of the skin. Itching of the cheeks may be part of itching elsewhere on the face or even involving other parts of the body. There are a host of possible causes and it is important that the itching is investigated by a doctor, preferably a dermatologist, to diagnose the exact cause. Personal hygiene can be a possible cause of itchy cheeks and should be excluded by thorough washing of the affected area. Skin oils, sweat and dead skin cells can irritate the skin surface if it is not removed frequently through washing and bathing. This is more of a problem for people with poor hygiene. It is easily remedied by regular washing of the face with soap or other mild cleansing applications. Most people do not cover their face as other areas of the body are covered. Without any shielding from environmental factors, the skin on the face may be irritated or even injured by sun exposure, wind, dust and other airborne irritants. These factors may also increase the risk of skin dryness or may stimulate excessive skin oil (sebum) and sweat production which can irritate the cheeks and cause itching. Various skin applications on the face can be a cause of itchy cheeks. Cosmetics (makeup), moisturizers, skin care and skin cleansing applications are some of the substances that may be used on the face. These substances may cause irritant or allergic contact dermatitis, depending on the type of substance, quantity and duration used, as well as individual sensitivity. Cosmetic treatments ranging from hair removal to facial chemical peels can irritate the skin and lead to itching on the cheeks. As is the case with skin applications, it depends on the type of cosmetic treatment and individual sensitivity to the specific procedure or applications used. It may include hair removal wax, depilatory creams, facial cleansers, exfoliators, moisturizers, facial masks and other substances used during the course of the treatment. Dry and oily skin are two extremes that may cause itching of the face. Dry skin is not uncommon and tends to occur with age, use of face cleansers and other applications, as well as with exposure to certain environmental conditions. Oily skin is more often a problem for teens and younger adults. Even without acne, oily skin may irritate the skin especially if it is not frequently removed through good personal hygiene. Facial hair on its own may cause itching of the face and cheeks. However, this is more likely to occur with ingrown hairs. This is an abnormality of hair growth where the hair turns in and the area may then become inflamed. Ingrown hair is a common problem for some people and without regular hair removal, longer hair follicles are more likely to cause itchy cheeks. Read more on itchy beard. Acne is a common skin problem, especially among teens and young adults. However, it can start later in life in some cases. 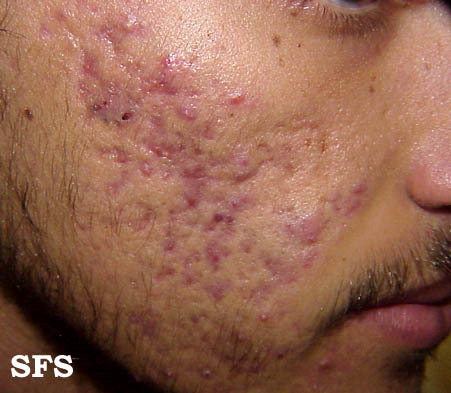 Typically acne presents with open and closed comedones (black- and whiteheads) as well as pimples. In severe cases there may be cysts. Although pimples can be painful, itching is a commonly reported symptom. Itchiness may be present even without any evident pimples. The cheeks are one of the most commonly affected sites in acne. Click here for a picture of acne. Sunburn can affect skin anywhere on the body and the exposed areas are naturally more prone. Even short periods of sunlight exposure can lead to sunburn if the sunlight is intense. Most of us have experienced sunburn at some point and initially the excessive redness, swelling and burning sensation may not be apparent. Sometimes there may only be mild itching of the skin, like on the face and particularly the cheeks and nose. 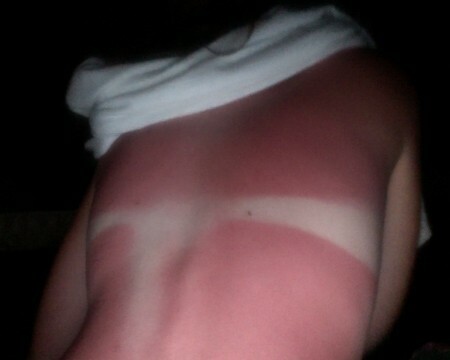 Click here for a picture of sunburn. A host of infections can affect the skin on the face. Viral, bacterial and fungal skin infections are common on the face region. Most viral infections are related to common childhood infections like chickenpox. Bacterial infections like folliculitis are another possible cause. 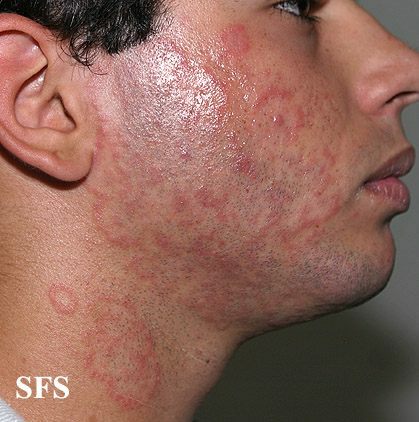 Fungal infections may also occur on the skin and are usually due to dermatophytes (tinea faciei and tinea barbae). This is similar to jock itch (groin) and athelete’s foot. Click here for a picture of a skin fungus on the face. There are many different types of dermatitis that can affect the skin on the face and cause itchy cheeks. Contact dermatitis is caused by substances that come into contact with the skin. These substances may irritate the skin or trigger an allergic reaction. Atopic dermatitis, also known as eczema, is more commonly seen among infants and children with a history of allergic conditions, including asthma. 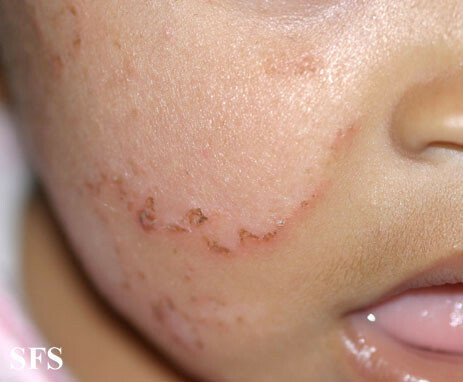 Seborrheic dermatitis is skin inflammation caused by excessive oil production (sebum) and can affect infants, children or adults. Click here for a picture of atopic dermatitis on the face. Psoriasis is an inflammatory skin condition where there skin does not slough off as normal leading to the formation of thick plaques. It appears to be an autoimmune condition with genetic predisposition. Psoriasis is known for being a very itchy skin condition. It tends to be chronic. While the face is not a commonly involved site, there may be lesions and itching on the face and cheeks in severe cases. 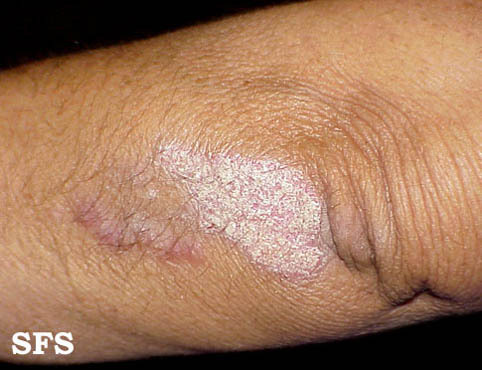 Click here for a picture of psoriasis.